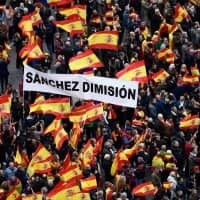 MADRID - Thousands of people demonstrated in Madrid on Sunday against Spanish Prime Minister Pedro Sanchez’s proposed talks to ease political tensions in Catalonia, in a protest organized by center-right and far-right opposition parties. Demonstrators waving Spanish flags filled the Plaza de Colon in the city center in the largest protest Sanchez has faced, with their slogan “For a united Spain, elections now!” a reminder of the pressure on his minority government. Failure by Parliament to approve the budget bill could prompt a snap election before the next scheduled vote in 2020. Center-right parties Popular Party and Ciudadanos organized Sunday’s protest, and the newly emerged far-right party Vox also participated. 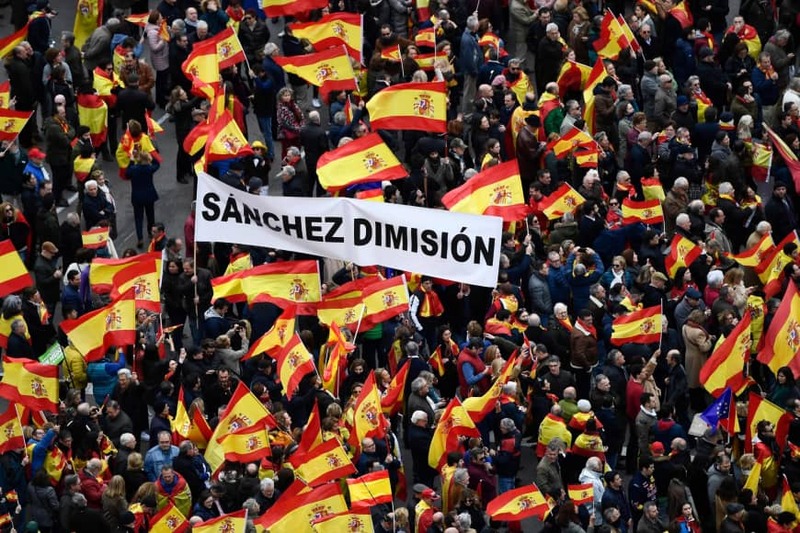 “The time of Sanchez’s government has ended,” Popular Party leader Pablo Casado said at the protest. “The government is giving many things to supporters of Catalan independence and is going to break Spain apart,” said Raquel Garcia, 76, who was carrying a Spanish flag.